Sometime early last week (i.e., in mid-October 2012), Globe and Mail reporter Marina Jimenez interviewed NDP leader Adrian Dix while he was in Toronto talking to bankers and presumably other business types. Prior to that, in mid-September, Mr. Dix “delivered “his first speech ever to the business crowd at the Vancouver Board of Trade….” (Dix not preaching to converted at board of trade speech, By Dene Moore, The Canadian Press, September 19, 2012). Quite obviously, the message Adrian Dix is hoping to convey to the public, and to the business community, is a reassuring message of calm surrounding the prospect of an NDP government in BC. Didn’t the NDP’s Mike Harcourt do, and say, very much the same thing back in 1991 just before he became premier? Well, yes, in fact, he did. Mike Harcourt actively made the rounds of various business groups and chambers of commerce in 1991 offering reassuring words about the prospect of a Mike Harcourt NDP government. “An overriding concern of the election planning team has been how to convince voters that this New Democratic Party is different from the one that governed British Columbia from 1972 to 1975. So, what did Mike Harcourt himself have to say about the new and improved version of the NDP that he was putting in the shop window back in 1991? Ah, “discipline” and sensitivity to “the mainstream.” This all sounds so familiar… and moderate. Well, we all know how “fiscally responsible socialism” ultimately turned out for BC, and within just a few short years after Mike Harcourt uttered these words of reassurance in 1991. That’s a question, call it a conundrum even, that many of us would like to see answered. In a socialist context, “redistribution” usually means high taxation coupled with big government and artificially creating employment by growing the public sector as opposed to the private sector. Okay, maybe it’s just me, but I can’t help wondering how Adrian’s message of restraint is going to go over with people like Jim Sinclair of the BC Federation of Labour, Susan Lambert of the BCTF, and the host of labour union bosses who are quickly filling the NDP’s candidate roster. I strongly suspect that a moderate pre-election Adrian Dix could very well find himself being fired as premier by the BC Federation of Labour, as Mike Harcourt was, if he was to govern as advertised in a responsible and moderate manner. To my mind, a post-election Adrian Dix would inevitably have to bend to the will and expectations of the NDP and its labour base around “redistribution policies.” Either that or Jim Sinclair will show him the door. What Adrian Dix may ultimately discover — as Mike Harcourt discovered — is that he is nothing more than a piece of politically moderate bait placed in the shop window to draw voters inside the NDP shop to make the sale (see “bait-and-switch”). I can’t possibly be the only person in this province who sees the symmetry between Mike Harcourt in 1991 and Adrian Dix in 2012. Surely others must have noticed this too, even though it seems to have completely escaped the notice of the media. Many thoughts certainly spring to mind in relation to the symmetry and parallels noted above. But at this point the expression “fool me once, shame on you; fool me twice, shame on me” should be playing loud and clear in the minds of critically minded BC voters regardless of the reassurances being spoken by Mr. Dix. If not, we’re likely doomed to repeat a bit a sad BC history having not learned an important lesson from the past. No shortage of Pattullo Bridge ideas — How about a tunnel? As I tweeted from last Thursday night’s New Westminster traffic plan / Pattullo Bridge meeting, “traffic is the #1 non-partisan issue in New Westminster.” It’s something that all 50,000 to 60,000 of the city’s residents can agree on. However, the solution to traffic in New Westminster is much more elusive (e.g., see this Vancouver Sun article from 1996). While many of those at last Thursday night’s meeting seemed ready to burn the Pattullo Bridge down — and blamed the bridge for all of the city’s traffic problems — as some others pointed out, you can’t take New Westminster in isolation from the regional context of 2.5 million people living, working and moving around. Any realistic solution has to work for New Westminster and for the region as a whole. Over the years, many people have suggested tunnelling, and putting the regional traffic underground, would be a way to achieve traffic peace for the people of New Westminster while also accommodating traffic movement through the region. Yes, tunnelling would probably be expensive. But ideas don’t cost anything and it never hurts to explore them fully to see where they might take us. For my part, I’ve been meaning to put my own idea for solving the Pattullo Bridge question on papter. Hopefully I can find some time to do this sometime soon. I call it “Patrick’s King For a Day Pattullo Bridge Plan” and it involves completing the Tree Island Bridge, rehabilitating the currently Pattullo Bridge as an urban bridge for local use, and building a new regional bridge upstream to take traffic directly from Surrey to Coquitlam and bypassing New Westminster. Keep in mind that, as I noted above, my idea involves me being King for a Day. That way (and purely for the purpose of allowing my imagination run free), inconvenient matters such as cost, engineering and environmental issues, and any disruption to people’s individual lives don’t need to be taken into account. 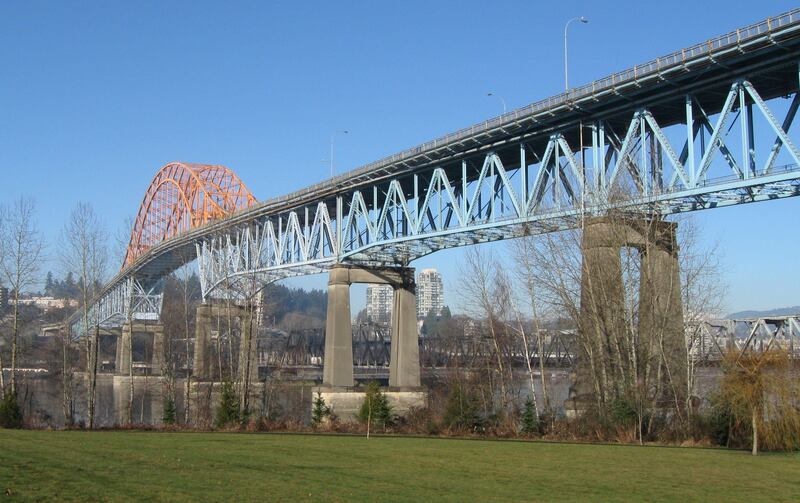 At the outset of a process like this, i.e., coming up with a realistic and effective plan for the Pattullo Bridge and traffic in New Westminster and the region, perhaps others could put together their own King for a Day ideas. You never know where they will ultimately take us. But getting back to the tunnelling idea noted above — Some people may have recently received a copy of a letter sent to New Westminster city council by Captain H.R. Johansen of New Westminster. Captain Johansen’s suggestion is to bring tunnelling experts from Norway to town to show us how it was done in their country and how this can be done in ours. He also proposes that a committee of New Westminster and Burnaby residents be formed in order to contact the Norwegian Tunneling Society and hold a fundraiser to pay for two of its members to come to New Westminster and Burnaby and assess how it can be done effectively. By bringing in experts with decades of experience at their disposal, Captain Johansen suggests, it might be possible to give the idea of building tunnels under and through our cities a boost and see it put on the table as a possibility. To raise capital funds for such a tunnelling project, and “without imposing more tax on the already over-burdened taxpayer,”Captain Johansen suggests something similar to “War Bonds” whereby “all Canadians could be given the opportunity to invest funds to help pay for the project,” and once complete, a small toll for using the tunnels could repay the investments plus interest. Captain Johansen’s idea is certainly one worth entertaining. It may well be that there is a potential solution here. What I would hate to see happen is for people in suits shutting down people’s imaginations prematurely as we fumble our way toward that ever-elusive solution to our traffic problems. 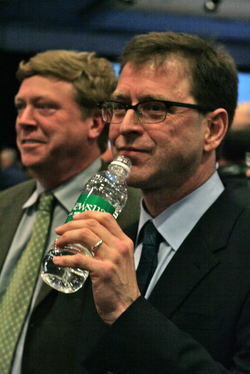 Okay, forgive me for finding amusement in this photo of BC NDP leader Adrian Dix drinking bottled water, but I really had to smile when I saw it. For me, a photo like this underscores the phony motives behind CUPE’s anti-bottled-water campaign — a campaign that has everything to do with protecting CUPE’s interests and nothing at all to do with genuine environmental concern. A busload of men who all look like my Dad…! Although I have one of the most Irish names imaginable (Patrick O’Connor), being of Irish descent wasn’t a particularly big part of my upbringing — other than the standard Catholic stuff that you might expect. We rarely saw any of our relatives on my father’s side (which is my Irish side), and my father was born in Vancouver and had never even been to Ireland. Growing up, our family’s “ethnic” identification, if you can call it that, was more with my mother’s French ancestry (my maternal grandparents came from the south of France from the area around Rodez in Aveyron). And my French (actually “Occitanian” grandmother — Marie Virginie [Pézenas] Lautard) — was our only grandparent still alive when my siblings and I were growing up. But I’ve strayed off topic and today is about being Irish…. Sure, we were very aware of Irish things and being Irish: My dad always made Irish coffee for people who visited around St. Patrick’s day. And we were very proud to be related by blood to President Kennedy through my dad’s grandmother, Bridget [Fitzgerald] Dolan (she was a blood relative of JFK’s beloved grandfather, Boston Mayor John “Honey Fitz” Fitzgerald). Why I would have said that I don’t really know. But considering the fact that 75 percent of my friends and classmates in the Oakridge neighbourhood of Vancouver back in the 1960s were Jewish, I suppose I must have felt that I needed some sort of “identity” too, and “Irish” is what I had (largely, I suppose, because of my obviously Irish name that adults never failed to comment on with a smile). In the very early 1980’s I had a couple of friends who lived in North Hollywood, California. I’d met them when they were here in Vancouver constructing a recording studio. They were both originally from England: Lawrence was from Liverpool (and of full Irish descent) and Lyle was from Leeds, with a very Irish surname. Getting back to my story… The first time I went to visit Lawrence and Lyle, and another friend, Vincent, in LA after they’d left Vancouver, they promptly took me to their favourite Irish pub in the Valley, even though they knew I disliked beer. Now it came to pass that the University of Notre Dame football team was coming to LA to play against USC. This was apparently a very big deal: From what I gathered, it had some sort of legendary aura around it and epic standing in the annals of sport history. But as someone with no interest in sports, it was all kind of lost on me. Lawrence and Lyle proceeded to explain to me that the pub owners had organized a bus for the Notre Dame game and tickets were being sold. Things were apparently going start off at the Irish pub in the late morning on the day of the big game, with drinking and sandwiches to continue on the bus, followed by drinking and cheering right through the Notre Dame versus USC football game. So I bought what turned out to be one of the very last tickets available (actually, I think all of the tickets had been long sold, but Lawrence and Lyle talked to the the pub owner who found a way to squeeze me into the bus). When we arrived at the Irish pub on the morning of the game, things were already well underway and the bus was being loaded (no pun intended) and was almost ready to go. As I climbed aboard the bus filled almost entirely with men, and looked back at all the faces sitting there, it struck me in an instant: Almost every man on this bus (virtually all of whom were Irish) looked exactly like my dad. It was as if someone had cloned my dad. And that’s when I realized just how Irish I really was. Even though I’m not a sports fan, I enjoyed the day and the atmosphere surrounding it. On the bus to the game I sat next to a cinematographer from Ireland who was almost the spitting image of my dad, but with an Irish accent. Sadly, I’ve lost touch with Lawrence and Lyle over the years. But I have lots of great memories from the time I spent hanging out with them in LA and the interesting people I met through them. At one event — backstage at an Emmylou Harris gig at the Palomino Club in North Hollywood — Lawrence and I were sitting around chatting with the members of the country band that had opened for Emmylou, along with a couple of their musician friends who’d come by to see them play. Lawrence obviously knew these guys, but it was lost on me who they were. My friend Bob posted a great photoshopped photo of Angelina Jolie and her leg… or should I say, legs. On Twitter last night, Michael Ewen claimed that the New Westminster School District’s paid fundraiser had raised over a million dollars over a four-year period. Okay, folks, time to put on your critical thinking caps and ask a few questions. If the district’s paid fundraiser was raising a quarter million dollars per year, on average, for the school district, then why would such a supposedly profitable initiative have been terminated? At $250K per year being raised one would assume that the paid fundraiser was raising more than the salary and benefit costs involved. Well, folks, appearances can be deceiving, and this is why I long ago realized that Michael was the master of the half-truth. Shortly after the SD40 business company was formed, with Michael Ewen at the helm, one of the first ventures they embarked on was to hire a paid fundraiser for the school district. Sounds fairly reasonable so far. However, what raised eyebrows throughout the school district was who the business company hired to be their paid fundraiser: They hired a recently retired school trustee named Linda Barron who had decided not to run for re-election just a few months earlier. I recall very clearly how — at one open board meeting shortly after Linda Barron’s hiring was announced — CUPE 409 President, Marcel Marsolais, stood up and angrily expressed his dismay at the hiring of Ms. Barron (who he did not name during the meeting). As I recall, Marcel also wrote a letter to the Record criticizing the hiring of this former SD40 school trustee. For many of us, the hiring of Linda Barron as a paid fundraiser was the first of many red flags raised in relation to how the business company was being run in those days. The issue surrounding Barron’s hiring should be obvious: If a paid fundraising position was going to be created in SD40, why was it not posted openly so that all qualified SD40 personnel could apply? In fact, several SD40 support staff posed that exact question to me, and to others. There were more than a few SD40 CUPE support staff who felt they were just as qualified to be a paid fundraiser for the school district as Linda Barron. For some, the hiring boiled down to pure cronyism. And it wasn’t long before other issues started to arise. One of the first issues that arose was in relation to the district’s community school coordinators who were already engaged in local fundraising with nearby businesses and community members. These local businesses, with established relationships with local schools, wondered why they were being approached by two people for contributions. When the community school coordinators raised this issue with the district’s administration, an edict came down from the board that all donations of cash or goods arranged for by the community school coordinators would henceforth be routed through the paid fundraiser (and be counted as part of the paid fundraiser’s fundraising total). Based on the above noted issues — and on requests from members of the community and district staff — the three community representatives on the school district’s Finance and Administration Committee (namely, Sanda Turner, Marjorie Staal and myself) requested a detailed breakdown of the funds raised by the paid fundraiser after her first year. It took a while, but we were eventually presented with information showing that the paid fundraising position had cost about $50K in salary and benefits and had raised $50K in that first year. It appeared to be a breakeven proposition. However, it’s worth noting that the total funds attributed to the paid fundraiser included the value of a donated time clock for the Queensborough Middle School worth several thousand dollars. This time clock was identical to a time clock that the same financial institution had donated to Glenbrook Middle School a few years previous — and without the efforts of a paid fundraiser. It was also noted by the community reps on the committee that some of the items attributed to the paid fundraiser as part of her total had actually been raised by the district’s community school coordinators. Nevertheless, we were all willing to acknowledge that this was only the first year of the paid fundraising position, but that an eye should be kept on the cost versus benefit of the position. Moving forward a little bit in the interest of brevity: It soon came to pass that another edict came down from the board to the effect that all monies raised by school PAC’s also had to be routed through the district’s paid fundraiser. For example, if a certain school was raising money for a new playground, the money had to be routed through the paid fundraiser (and subsequently appear as part of the total funds raised by the paid fundraiser). The rationale for this new edict was somewhat lame in my opinion, and also in the opinion of many others: It was claimed that the paid fundraiser could issue tax receipts through the Royal City Education Foundation. Okay, you’ve probably spotted the next question everyone asked: Why do we need a paid fundraiser to issue tax receipts on behalf of the Royal City Education Foundation? Why couldn’t a clerical staff person in the district’s administration office issue the tax receipts and process the paperwork? Carrying out this relatively simple task was clearly not a fulltime job. Oh, and I forgot to mention that after the first year or so working under the umbrella of the business company the paid fundraising position was transferred out of the business company and into the school district itself — and without much in the way of open discussion. This, of course, brings us back to the question of why the position was created within the business company, and clearly for a specific person, rather than being openly posted so that all equally qualified school district CUPE support might apply for the job? Subsequently, as I understand it, any money that came into the school district or Royal City Education Foundation was deemed to be the result of the paid fundraiser’s efforts regardless of its real source. So, going back to the initial question I posed: If the district’s paid fundraiser was raising a quarter million dollars per year, on average, for the school district (as claimed by Michael Ewen), then why would such a supposedly profitable initiative have been terminated? the actual money being raised over and above the baseline donations that were already coming into the school district through other fundraising means. Claiming that the paid fundraiser raised over a million dollars over four years (as Michael did in his tweets last night) simply isn’t supported by the facts. The claim is nothing more than a half truth. Moreover, it should be very clear that Michael is also incorrect in claiming — as he also did on Twitter last night — that nothing has been raised by the district since the paid fundraising position was terminated. This claim is clearly false because money and goods are continually being donated to the school district through a variety of channels, not the least of which are the district’s various PAC’s. The bottom line is that the paid fundraising position was not successful and was not cost-effective. That’s why it was eliminated. Pure and simple. And it has nothing whatsoever to do with Voice as Michael claims. Below, I’ve pasted the relevant tweets between Michael Ewen and myself last night. Now that I’ve had a better opportunity to review the legal opinion Trustee Lori Watt received from lawyer Jonathan Baker it really does seem to fall short of fully recognizing the issue. So this morning I sent a formal email to all of the Trustees of the New Westminster Board of Education, Superintendent John Woudzia and Secretary-Treasurer Brian Sommerfeldt offering my observations on Trustee Watt’s legal opinion. In my email I once again strongly encouraged the New Westminster school district to secure its own independent legal opinion. To read a copy of my email to the board and senior administration please click here. To read a copy of my side-by-side comparison of the two legal opinions please click here. My email was also copied to the Minister and Deputy Minister of Education and to the local media.